We have forged strong links with a select group of local farmers, who produce livestock specifically to our requirements and exacting standards. All livestock is traditionally reared and nurtured using an agreed breeding, feeding and production programme. 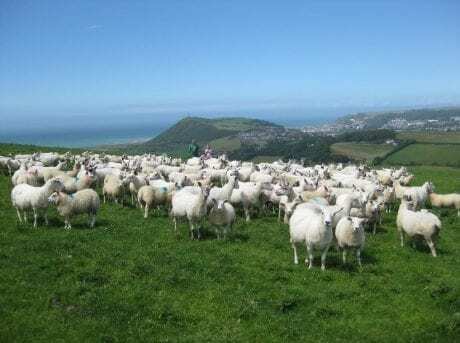 Livestock graze on the lush and fertile pastures of the West Wales coast, where the high rainfall, mild climate and prevailing westerly sea wind ensures grass is plentiful and rich in nutrients, giving our meat its distinct sweet and succulent flavour. The livestock farmers we work with are all renowned for their ability to produce the finest quality meat from grass. Welfare standards are high and are approved to Farm Assured Welsh Livestock standards. Livestock is slaughtered at the local abattoir in Tregaron, which is governed by the Meat Hygiene Service. Because we use local farms and a local slaughterhouse, stress on livestock (and producer!) is kept to a minimal and is produced with the benefit of the local environment in mind. By keeping our ‘food miles’ at an absolute minimum, we can enjoy our meat safe in the knowledge that not only does it taste delicious, but that it’s also absolutely traceable and trustworthy. He can recall many years ago when two of our suppliers, Alwyn Davies, Brenan and Aeron Hughes, Cwmhendryd were part of a winning stockjudging team at Birmingham Fatstock Show, thus reflecting their superior standard as stockmen.